Because I am impulsive, a middle child, did not grow up getting presents and swag bags every day of my life just for being a kid, I have these obsessions with acquiring books and typewriters. More than I could reasonably use. 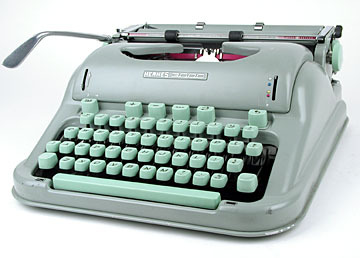 I have the typewriter of my dreams, the Hermes 3000. Sweet, right? Seriously? I want to eat it. If you scratch and sniff the picture it smells like mint cause it’s that minty fresh. Then I saw this sweet 95.00 electric brother typewriter. Looked like something my boys would use. Also, looked like a typewriter so thus, a great idea. so I bought it and brought it home, this is some of what we left behind. Old school, Works, part of Bill’s personal collection. If you haven’t been to this wonderful wonderland, please take some time to visit. But buy a typewriter because it is magical, like having a convertible. This entry was posted in Uncategorized and tagged 21st century learning, Mesa Typewriter Exchange. Bookmark the permalink.